Though this is Asian-inspired there is nothing authentic this or that about it. The flavors and ingredients were something that came together as I watched Daisy chase squirrels through Golden Gate Park. It’s hilarious how beautifully a new recipe manifests in your head, when the reality turns out to be a big mess. Like the gluten-free rugelach I just made. We won’t talk about it… Fortunately this recipe worked really well, which is good, because I’m not going to lie, this is a lot of work for a bowl of food. But it’s delicious and will make you and yours very happy on a cold blustery day. So what is it you’re looking at? At the bottom of the bowl is a ladle of rich, homemade chicken broth spiked with ginger and cilantro. On top of that is brown rice cooked in the broth and tossed with fresh green onion. 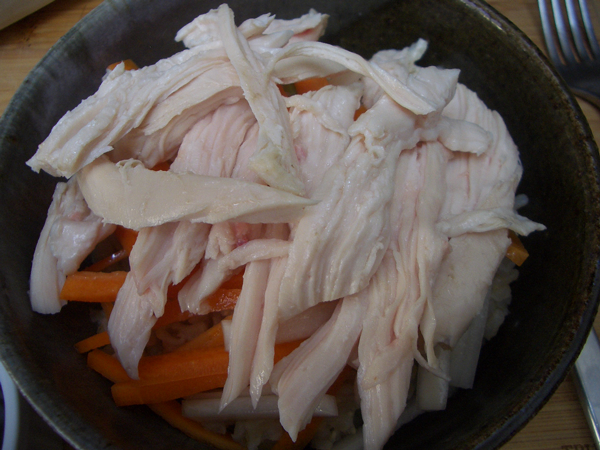 On top of that crunchy daikon and carrot sticks and poached chicken. 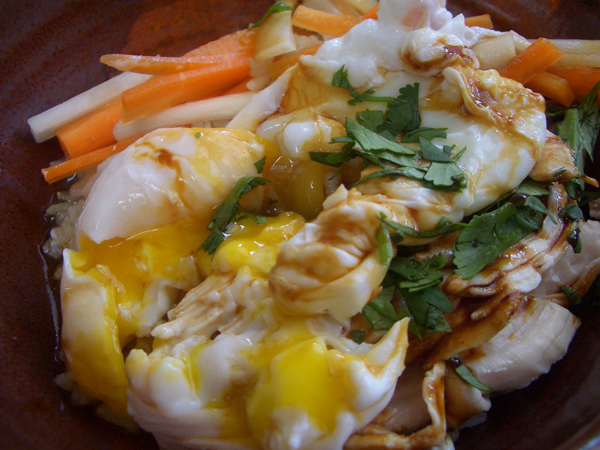 On top of that a poached egg and rice vinegar/soy sauce/ginger/garlic reduction. A sprinkle of fresh cilantro and you’re done. Yum. This dish has a lot of moving parts so doing it all in one go might be a bit overwhelming. 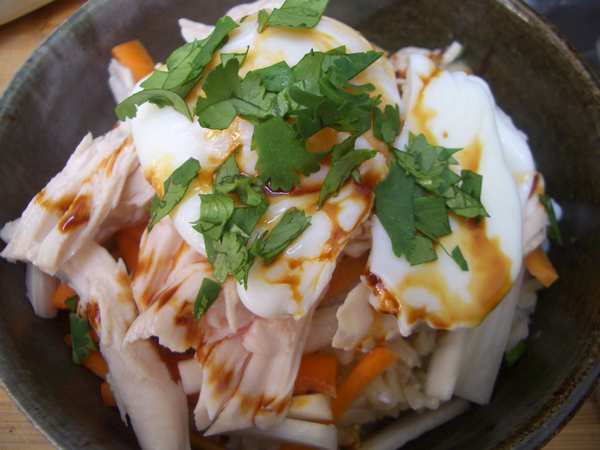 You can make the broth, rice, drizzle sauce and chicken the day before. Reheat the rice and the drizzle sauce in the microwave and dip the chicken in the hot broth. Don’t microwave the chicken or it will be rubbery. You could also buy canned broth, cooked chicken and rice, but then you wouldn’t have the build of flavors one step to the next. Your call. 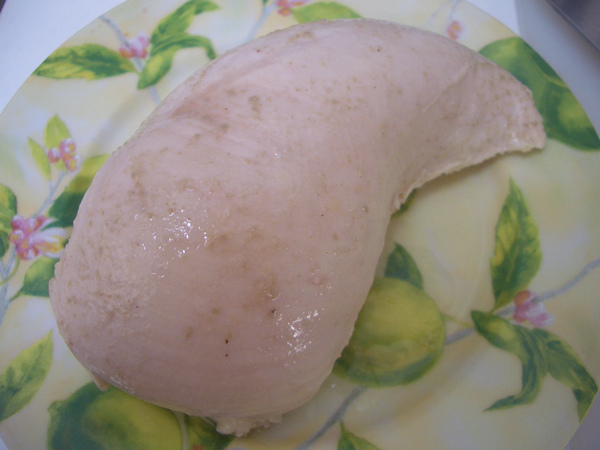 1 large boneless whole chicken breast–I think this is enough for 4 people, but you can add another breast if you like. You can use any vegetables you like. Just try to pick things that don’t need to cook for a long time–zucchini, mushrooms, cucumbers, peppers, etc. You want a small handful of vegetables for each bowl. Anytime you serve a runny egg, you want it to be organic and as fresh as possible. 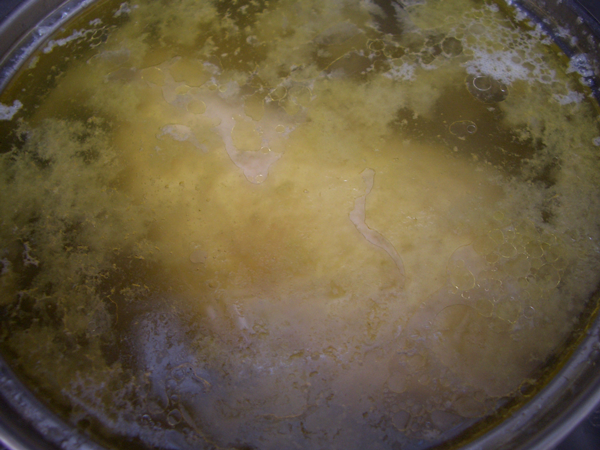 In a stock pot or large saucepan, heat the olive oil over medium heat. 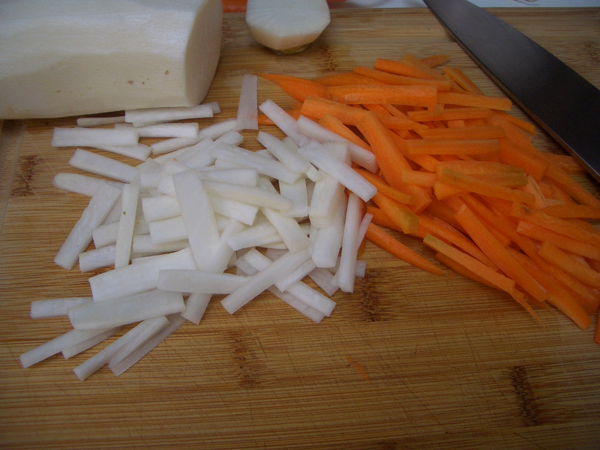 Add the onion, carrot, celery and salt and cook 5 minutes until the onions are soft and translucent. 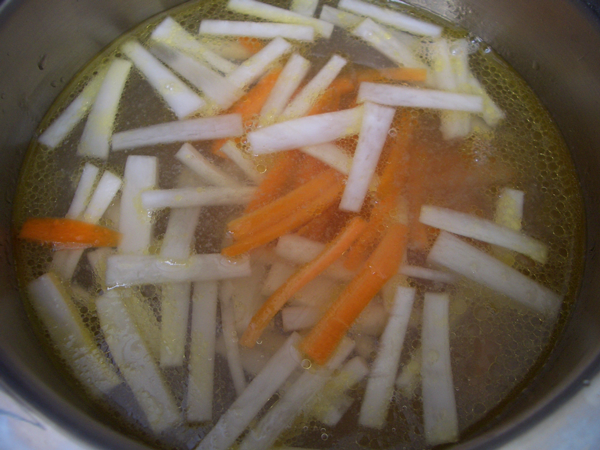 Add the ginger and cook until fragrant, about 1 minute. Add the chicken wings or backs, hot water, bay leaf, cilantro and peppercorns. Bring to a boil then reduce to a simmer and cook for 2 hours. Strain the broth and set aside. If you’d like to remove the fat, please do. Cook the rice according to the directions, using the broth instead of water. 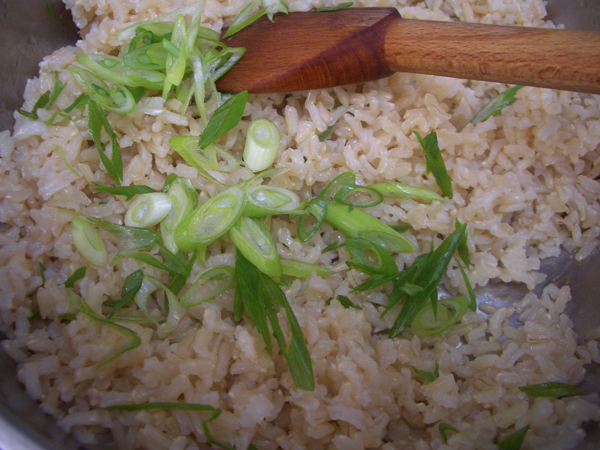 When the rice is cooked, toss in the green onions, cover and set aside. 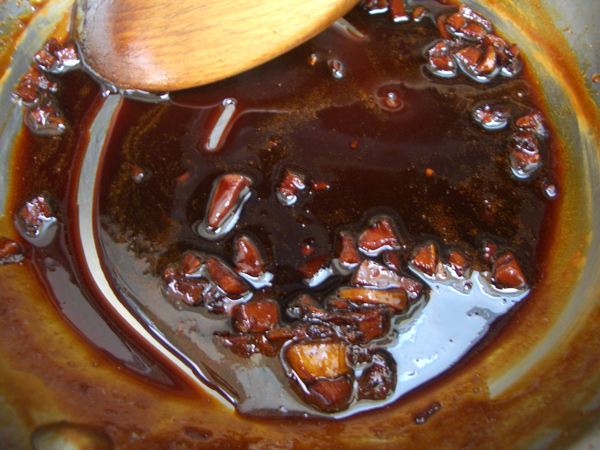 Add everything to a small saucepan and simmer over medium heat for about 20 minutes or until thickened and syrupy. Watch closely because the sauce can burn in a flash. Strain the sauce and set aside. The sauce gets stiff as it cools. 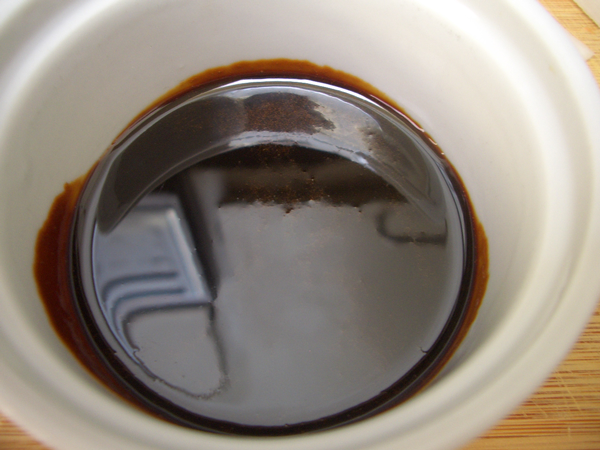 Just pop it in the microwave or dip the bowl in hot water for a few seconds to loosen it up. When it hits the heat of the poached egg it just melts into everything and it’s a beautiful thing. Remove any fat or cartilage still attached to the breast. and place it in a small pot. Add enough broth to cover. Don’t use a big pot or you won’t have enough broth. Bring to a boil, take off the heat, cover and let sit for 30 minutes. When the chicken is cool enough, shred it with your hands, cover and set aside. At this point you might want to strain the broth through some cheese cloth as it’s likely to be a bit cloudy, but you don’t have to. 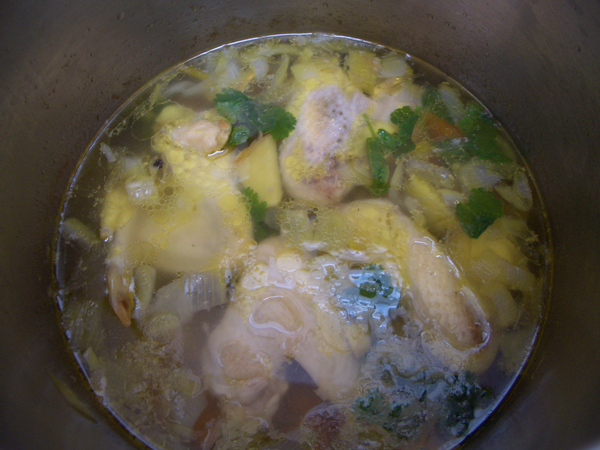 After the chicken is done, add the vegetables to the hot broth, cover and let steep for about 5 minutes. Remove with a slotted spoon and set aside. Set the oven to warm. 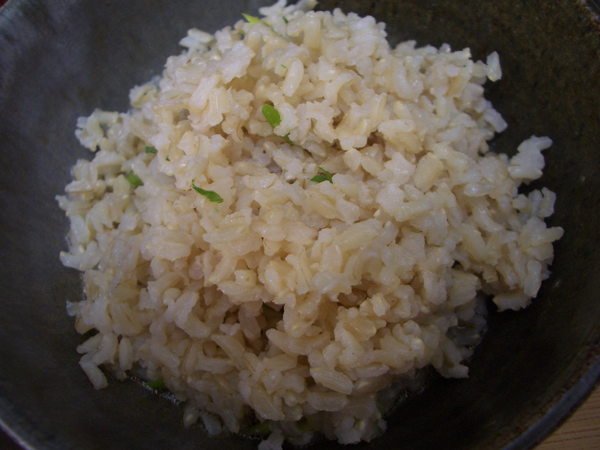 In a large soup bowl, add a quarter of the rice. Spoon a ladle of the hot broth over the rice. Add the vegetables and the chicken. Put the bowls in the oven to keep them warm. 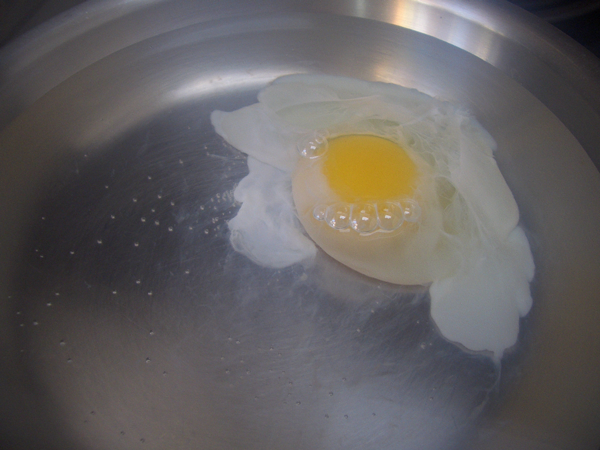 I don’t care how easy people say poaching eggs is… it’s nerve-racking. If you’re making this for guests, practice on an egg or two in advance, and have a sense of humor and extra eggs. Or use an egg poacher! Crack the cold eggs into small bowls/ramekins. Bring about 2 inches of water and 1 teaspoon (5ml) of rice vinegar to a boil in a shallow pan. Reduce to a low simmer. Take note of the order in which the eggs are going into the pan so you can remove them accordingly. At this point you can add the eggs to the water from the bowls, holding the bowls very close to the water and gently sliding them in–the more movement you create the more the egg whites will break apart. OR you can do what I do and add the eggs to a soup ladle and submerge and tip them into the water that way. The ladle allows you to keep your hands away from the hot water. 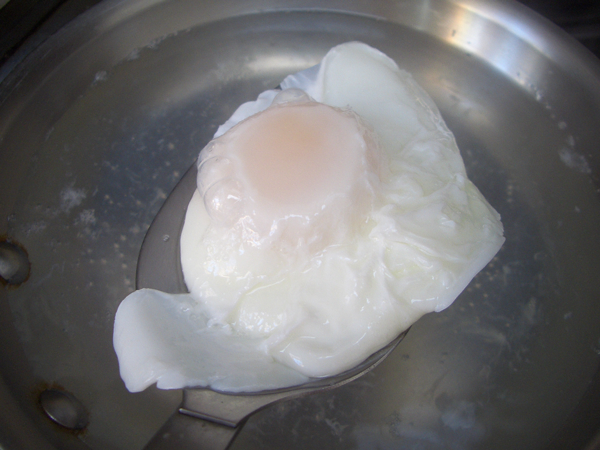 Cover the pan and cook for 3-5 minutes, depending on how runny you like your yolks. Have the bowls of rice, veg and chicken and drizzle sauce at the ready. Using a slotted spoon, gently remove the eggs in the order they went into the pan. Make sure to have the spoon centered under the egg. Picking the eggs up from one side or the other might cause the delicate whites to break. 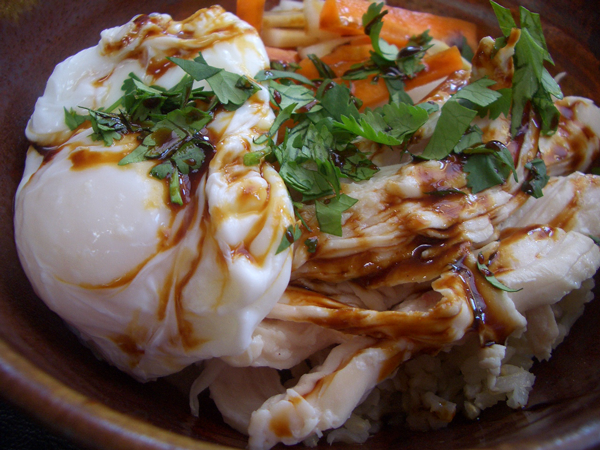 Add the eggs to the rice bowls. Drizzle the whole thing with the sauce. Top with freshly chopped cilantro. Serve immediately.